What happened to Cuba's Oswaldo Payá? 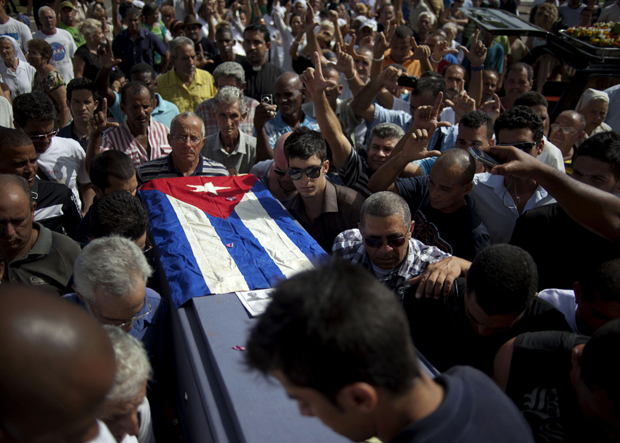 Friends and family of the late Cuban activist Oswaldo Paya carry his flag draped coffin during his burial at a cemetery in Havana Tuesday. Paya, 60, gained international fame as the lead organizer of the Varela Project, a signature-gathering drive asking authorities for a referendum on guaranteeing rights such as freedom of speech and assembly. 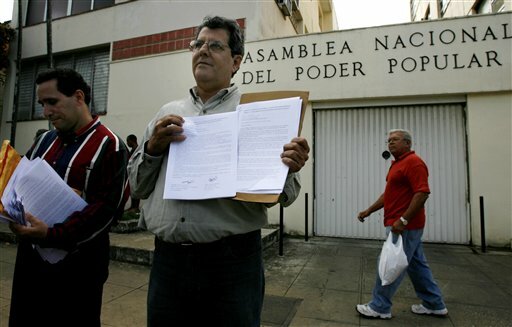 Oswaldo Payá presenting his citizen petitions to the Cuban National Assembly in 2007. Did Oswaldo Payá die in a straightforward auto accident, or was he killed by Cuban government forces? According to official reports, Payá and another Cuban died when the driver of the rented car he was in lost control and violently crashed against a tree in the far Eastern side of the country, where roads are particularly bad. But speculation swirls around the incident. Was the car run off the road by another vehicle? Payá’s daughter, Rosa María, says that’s the case, that maybe it was only meant to be a warning but that her father ended up dead as a result. This would be the second auto accident Payá had in less than a month, and in the first he was run off a Havana street by another car. In most other countries perhaps, this tragedy would be treated as a simple automobile fatality. But in Cuba, which has seen dissidents dropping like flies in the last few years, and where authorities operate in secret, defensively, and without explanation, every move stirs suspicion and doubt. It’s not that Cuba puts its dissidents up against the wall and shoots them (although 40 years ago, it did just that). And under Raúl Castro, the long prison sentences that were the staple of Fidel Castro’s rule have become rarer. But this is not because Raúl is more tolerant. His tactics regarding dissidents are simply different: Rather than virtually disappearing them into the black hole of prison, Raúl bullies and harasses them in plain sight, often violently, giving street toughs carte blanche to do as they will. Consider this video of “acts of repudiation” against the Ladies in White, the female relatives of political prisoners swept up in the 2003 Black Spring. The “acts,” which the government doesn’t officially admit to encouraging but for which every Cuban has been recruited at some time in their lives, involve the crudest and most vulgar epithets, pushing, shoving, and, sometimes, punching. When the cops finally show up, they arrest the Ladies in White. And say what you will about them — even if you believe they’re funded by nefarious U.S. based forces — the Ladies in White are absolutely non-violent. So why the use of such force? And how, exactly, does a scene like this, taken with a cellphone, unfold in a Havana suburb, with both sides approaching each other as if in a duel? The result? A street fight: primitive, mindless. Where was the police? Nowhere, which given their ubiquity in Havana, is a real question. Or consider this one, also from a cell, in which a dissident is confronted by an organized crowd outside his home. They chant slogans endlessly while Félix Navarro tries to talk to them, his voice even, his hands always where they can see them. The cops show up for this — but not to disperse the crowd or negotiate a public peace. Instead, they arrest Navarro and take him away. The charges? None, as was the case with the 50 or so mourners who attended Payá’s funeral and found themselves detained without charges for about a day. Among those held overnight was Guillermo Fariñas, a dissident whose 2010 hunger strike forced the government into negotiations with both the Catholic Church and the Spanish government and into releasing the prisoners from the Black Spring. Fariñas, like Payá, is a recipient of the European Union’s Andrei Sakharov Prize for Human Rights. Why does any of this matter? Besides the fact that two men died in that mystery crash, one of them happened to be one of Cuba’s best known dissidents, but also one of its most curious. Even tempered, measured in his statements, and a man who kept his government job long after he could have given it up to live off remittances from abroad, Payá founded the Christian Liberation Movement, a party that remains illegal in Cuba. (All but the Cuban Communist Party are illegal on the island.) Committed to non-violence and a lifelong practicing Catholic, Payá — who was also a lifelong anti-communist — was best known for two projects that, at their core, ironically recognized the fundamental legitimacy of the revolutionary government. Payá’s second petition drive, the Heredia Project, demanded that the government — which currently charges an arm and a leg for a passport and other travel documents (and in Cuba, Cubans always need other travel documents) -- allow Cubans to come and go, to housing rights, to equality before the law, and to citizenship regardless of their place of residence, as the constitution guarantees. What set Payá apart was less the projects themselves — which were brainy but futile — than that, while he understood that the government had all the power, he never, ever called for Cuba’s problems to be solved by anyone but Cubans. And by Cubans, he meant those on the island. It gave him an incredible moral force. What happened to Payá? We may never really know.